Traditionally high-tech footwear is designed for the pavement not the runway. 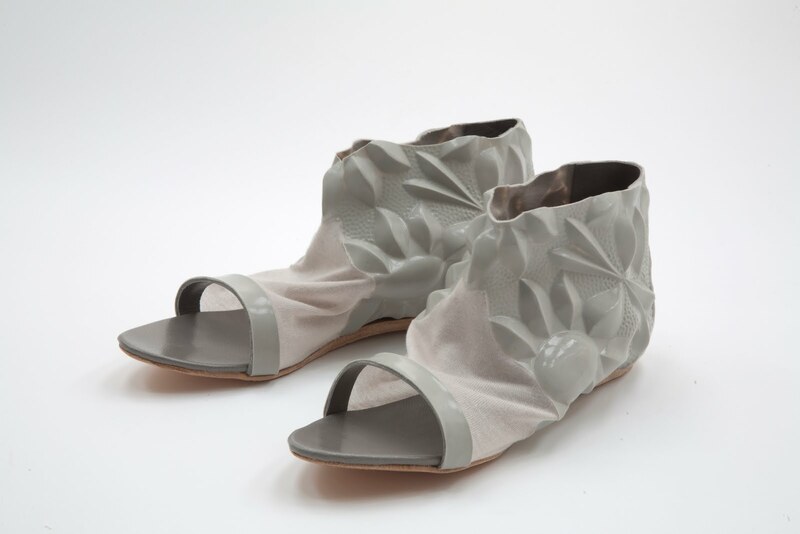 Shoe designer Zuzana Serbak breaks away from these traditions by using industrial high tech materials such as carbon fiber and silicone to craft futuristic sandals and voluminous heels. Upon seeing her graduate collection (Zuzana graduated from Academy of Arts, Architecture and Design in Prague, Czech Republic this year), I invited Zuzana for an interview to learn more about her process and inspiration. To learn more about her work, please follow Zuzana’s blog or introduce yourself to Zuzana here on FT. Since my early times I was enjoying arts and design and was interested in different textile techniques and technologies. I based my studies on my interests. At the Academy I’ve just finished I learned to design and make shoes and fall in love with this beautiful industry. Your graduate line was inspired by “composite materials” such as carbon fibre and silicone. How did you use these materials to construct your line? What drew you to work with these materials in the first place? I was interested in using high-tech materials not typically used for shoemaking. I was wondering how I can use the character of these materials in behalf of shoes. I was experimenting with different materials and had to select the strongest ideas. The definition of “composite materials” is about mixing two or more materials with absolutely different character (for example fiber reinforcement and liquid matrix) to get a composite with multiplied features. My experimentations were based on this definition. The idea of mixing different materials interpreted as visual element was also an inspiration for me. Material research and innovation in shoe design is typically found in the sports footwear and apparel industry not high fashion. What role do you envision high tech materials playing in high fashion? My aim was to try new materials and influence the construction this way. I think carbon fibre is fabulous for high heels. It’s extremely strong and beautifully lightweight that matches with the subtly of women’s feet. 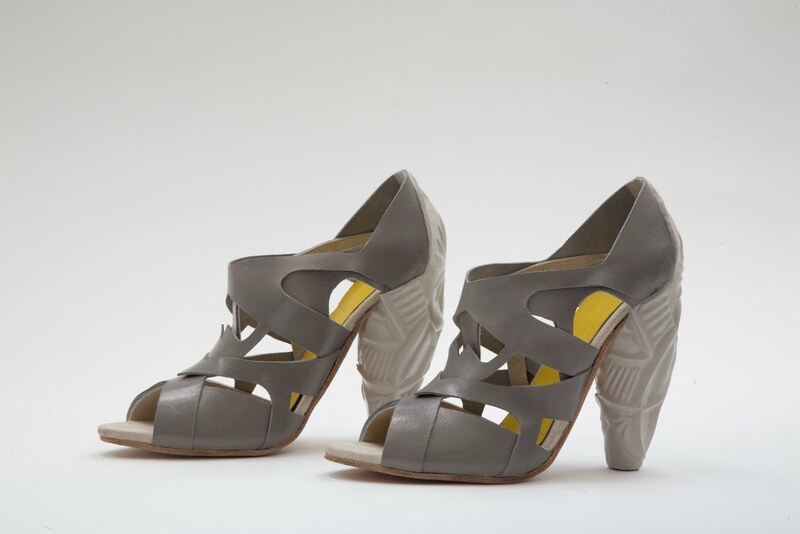 The material allows one to make an extremely slim heels and bulbous/bulky ones at the same time. In my designs I also combined the shank piece with the heel so it was not necessary to use a common steel shank piece. [Carbon fiber is} extremely strong and beautifully lightweight that matches with the subtly of women’s feet. Little innovations like this simplify the production process and minimize the composition of the shoe. I also experimented with leather reinforced resins and leather reinforced silicones. I used a specially developed silicone in different ways, eliminating the reinforcements used for shoes. Again silicone is flexible and soft but firm enough to keep the shape of the shoe (toe, heel seat) and prevent it from deformation through wear. Your designs look futuristic, organic and whimsical at the same time. What was the inspiration for the variation forms in your collection? As soon as I discovered what’s possible and what’s not with those materials, I started to concentrate on forms. As I mentioned, carbon fiber and silicone offer a wide scale of shapes, forms. More than a “fashion line” this collection shows the manifoldness of materials I used. From slim to bulky shapes in carbon fiber and from liquid, creamy to crystalline in silicones. Each shoe is expressive in its own way but together they create a story, a coherent concept. Which shoe would you say is your favorite and why? Basically i do not have any favorite. There is an idea in every shoe. Each shoe is expressive in its own way but together they create a story, a coherent concept. I‘m balancing between being employed as a full time designer for a high end company and my dream to run my own brand. At the moment I’m a freelance designer and collaborating with accessories design studios and fashion designers.